Chapter 7 of Daniel describes four beasts coming up from the Mediterranean Sea. What did Daniel’s vision represent, and what does it mean for us today? The seventh chapter of the book of Daniel records an unusual vision that he received in the first year of the Babylonian king Belshazzar (555-556 B.C.). The vision predicts major world empires and events from the time of Daniel to the second coming of Christ. The vision ended with Daniel saying, “My thoughts greatly troubled me, and my countenance changed; but I kept the matter in my heart” (Daniel 7:28). What did Daniel see? In verse 1 Daniel had “a dream and visions of his head while on his bed.” This is the same expression that was used in Daniel 2:28 concerning King Nebuchadnezzar’s “dream and visions” that came in the second year of his reign (603-602 B.C.). The two sets of dreams and visions were about 50 years apart; but as we will see, they both describe four world empires. 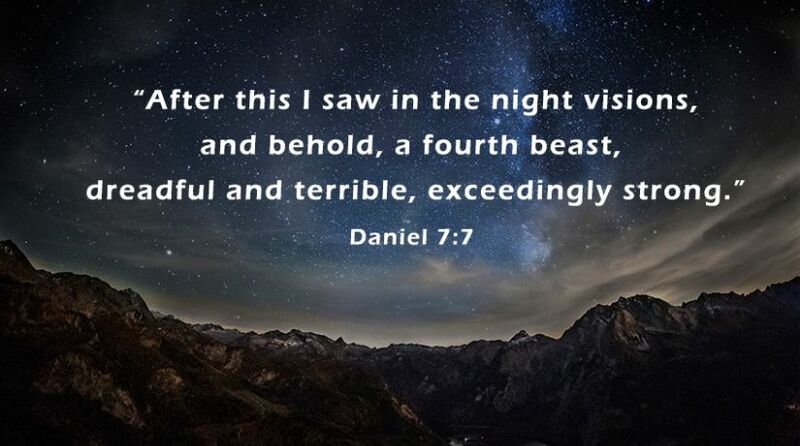 The vision of the four beasts and the little horn found in Daniel 7 reveals more information about the same four empires that are first described in Nebuchadnezzar’s dream of a great image. In verse 17 we are told, “Those great beasts, which are four, are four kings which arise out of the earth.” The lion was symbolic of the kingdom of Babylon and the “man’s heart” was that of its most notable king, Nebuchadnezzar, who is written about considerably in the first four chapters of Daniel. As The Expositor’s Bible Commentary explains, “The lion symbol was characteristic of Babylon, especially in Nebuchadnezzar’s time, when the Ishtar Gate entrance was adorned on either side with a long procession of yellow lions on blue-glazed brick, fashioned in high relief” (1985, Vol. 7, pp. 85-86). The eagle’s wings plucked off the lion were symbolic of Nebuchadnezzar’s time of insanity when he was humbled by God to learn that “the Most High rules in the kingdom of men” (Daniel 4:17, 34-37). Nebuchadnezzar ruled from Babylon to Asia Minor and from the Caspian Sea to Egypt. Biblically, his most notable conquest was that of the nation of Judah, with Daniel being the most famous captive from that nation. Following his father’s death, Nebuchadnezzar reigned as king of Babylon for 43 years, from 604-561 B.C. (JewishEncyclopedia.com/Nebuchadnezzar). After his death, Babylon continued as a strong empire until 539 B.C., when it was conquered by the second rising power in Daniel’s vision, the Medo-Persian Empire. This beast’s being “raised up on one side” represents the Persians being greater than the Medes in this federated empire. This is made plain to Daniel in a vision two years later when he sees a ram with two horns, one being higher than the other. Daniel is told by the angel Gabriel that the ram represents the kings of Media and Persia (Daniel 8:3, 20). The three ribs that are devoured represent three empires conquered by Persia’s first great king, Cyrus the Great, and his son, Cambyses II. Cyrus came to power in 558 B.C. and conquered the Lydian Empire (Asia Minor) in 546 and the Chaldean Empire (Babylon) in 539; and Cambyses conquered Egypt in 525 (ibid. p. 86). The Medo-Persian Empire lasted for 200 years and, under later kings, expanded to Greece in the west and to India in the east. At one point, the Persian Empire covered parts of three continents: Asia, Africa and Europe. But, like the Chaldean Empire, the Persian Empire finally came to an end. A new beast was rising in the west, and its appointed time had come. As with the second beast, the third beast is clearly identified by the angel Gabriel. It was Greece, and the “first king” was Alexander the Great. After his untimely death in 323 B.C., his empire was divided into four smaller kingdoms (Daniel 8:21-22). The symbol of the leopard with four wings portrays the swiftness of Alexander’s sudden rise and conquest of the Persian Empire from 334-331 B.C. After his death, several years of struggle ensued that resulted in the division of his empire into four kingdoms. The new kingdoms were (1) Greece and Macedon, (2) Thrace and Asia Minor, (3) Middle East-Asia and (4) Egypt-Palestine. “After this I saw in the night visions, and behold, a fourth beast, dreadful and terrible, exceedingly strong. It had huge iron teeth; it was devouring, breaking in pieces, and trampling the residue with its feet. It was different from all the beasts that were before it, and it had ten horns.” The last two were ruled by Seleucus, who began the Seleucid Empire, and Ptolemy, who began the Ptolemaic Empire. These two kingdoms are called the king of North and the king of the South in Daniel 11. Approximately two centuries later, the fourth beast conquered all four of these kingdoms and expanded far beyond the lands conquered by the previous beasts. These two kingdoms—called the king of North and the king of the South and having yet to be determined configurations—will revive and play major roles in end-time prophecies. The devouring teeth of iron and the trampling feet correspond with Nebuchadnezzar’s vision of the fourth kingdom being strong as iron, breaking in pieces and crushing all others (Daniel 2:40-41). When the Roman Empire came to power under the Caesars (44 B.C.) it devoured, broke in pieces and trampled the residue of its enemies with its feet—as was described in Daniel’s vision in Daniel 7. The fourth beast is quite different from the previous beasts, in that it has 10 horns. Daniel 7:24 says, “The ten horns are ten kings who shall arise from this kingdom.” Historically, these revivals began to rise after the fall of Rome in A.D. 476, with the later ones under a new name: the Holy Roman Empire. (For additional information, see “What Is Babylon?”). This fourth beast would continue to be revived off and on for over 1,500 years until the end-time 10th revival. The 10th and final revival will be destroyed by Jesus Christ at His second coming (Daniel 7:26-27). This leads to one other unusual feature of the prophecy of the fourth beast. This little horn represents a powerful religious system that would align with the last seven of the 10 political horns that were to arise after the fall of Rome. This coordination between church and state produced what ultimately became known as the Holy Roman Empire. In verses 21-22 and 25, this little horn makes war against the saints, speaks pompous words against God, intends to change times and law, and persecutes the saints for a “time and times and half a time” (literally three and a half years, but using the day-for-a-year principle of Numbers 14:34 and Ezekiel 4:6, 1,260 years). Evidence of this persecution can be seen through the centuries, as hundreds and thousands of people in Europe lost their lives through the inquisitions of the Roman Catholic judicial system. They were tortured for confessions of being heretics and killed because they would not submit to the authority and doctrines of the Roman Catholic Church and the pope. Though the inquisitions of that time were abolished, the Bible indicates religious persecutions from the “little horn” will come back and result in the death of many before the return of Christ. Daniel also saw the conclusion concerning the “little horn”—that when Jesus Christ returns, “the court [judgment] shall be seated, and they shall take away his dominion, to consume and destroy it forever” (verse 26; Revelation 18:2). The vision of Daniel 7 could not end with any greater news: “Then the kingdom and dominion, and the greatness of the kingdoms under the whole heaven, shall be given to the people, the saints of the Most High. His kingdom is an everlasting kingdom, and all dominions shall serve and obey Him” (verse 27). This prophecy ends by revealing that Jesus will establish the Kingdom of God on earth and give it to the saints of the Most High. What is the biblical definition of a saint? How does an individual become a saint and inherit this Kingdom? The study of the prophecy of the four beasts and the little horn may be very interesting, but the answers to these most important questions of life are what matters in the end. We recommend readers go to the section on “Change” to discover the answers. 70 Weeks of Daniel: What Does the Prophecy Mean? Abomination of Desolation: What Is It?